The devastation created by Hurricane Harvey and Hurricane Irma is heartbreaking. Our fellow Americans need our help now more than ever. 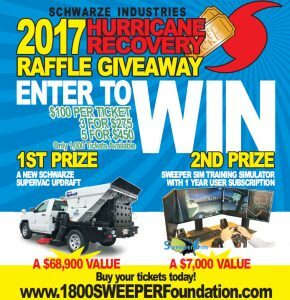 Schwarze Industries, together with the 1-800-SWEEPER Foundation, has created a unique opportunity for members of the Power Sweeping industry and others to contribute to the Red Cross Hurricane Relief effort following these catastrophic weather events occurring in August and September 2017. The Hurricane Recovery Raffle, tickets priced at $100 each, offers a chance to win a brand new Schwarze Supervac Updraft power sweeper, valued at $68,900, as the top prize. Municipalities, landscape companies, professional power sweeping companies and other service industries are encouraged to participate based on the high value and nearly universal industry appeal of the top prize. Second prize, valued at $7,000, is a complete SweeperSim hardware and software package created by 1-800-SWEEPER for sweeper operator driver training simulation. Only 1,000 tickets will be available. 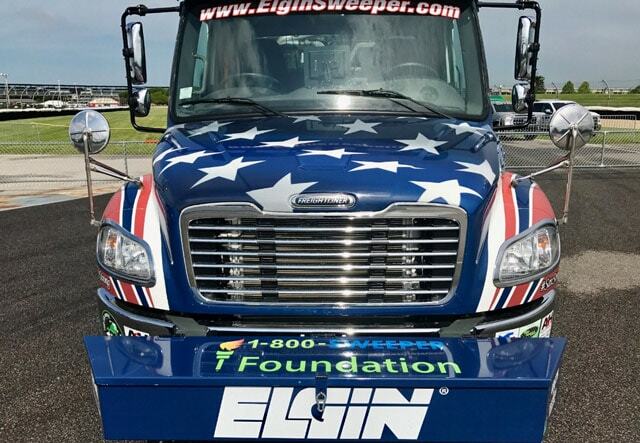 On February 1, 2017, the 1-800-SWEEPER Foundation made a $2,500.00 donation to help the victims of the wildfires in Gatlinburg and surrounding areas in Tennessee. Days-long fires ravaged an estimated 17,000 acres and destroyed more than 100 structures in late November 2016. The Tennessee Emergency Management Agency reported that approximately 700 structures were impacted and about 14,000 residents were displaced. Local 1-800-SWEEPER Partner, Pete Phillips of Clean Sweep, Inc. in Chattanooga, TN, presented the check to a representative of the Gatlinburg, Pigeon Forge and Sevierville Emergency Response Fund to aid the victims of the Gatlinburg wildfires.